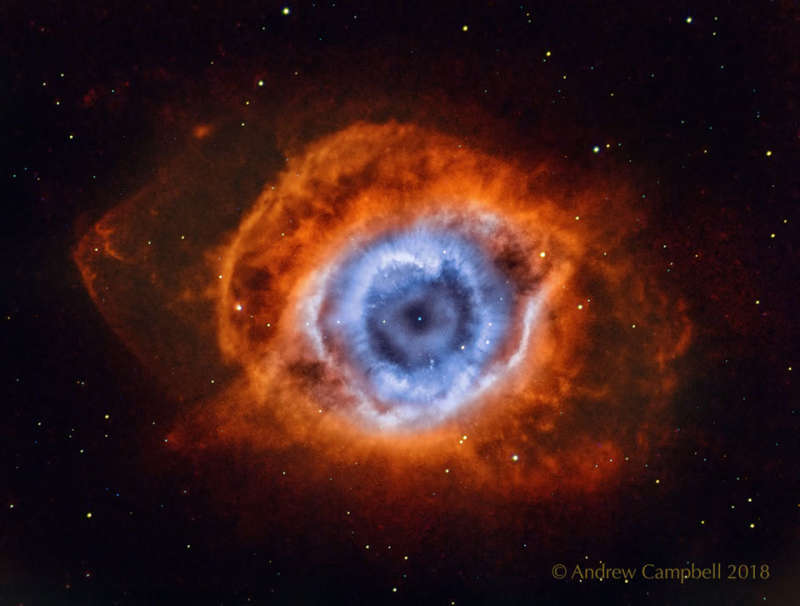 Explanation: Is the Helix Nebula looking at you? No, not in any biological sense, but it does look quite like an eye. The Helix Nebula is so named because it also appears that you are looking down the axis of a helix. In actuality, it is now understood to have a surprisingly complex geometry, including radial filaments and extended outer loops. The Helix Nebula (aka NGC 7293) is one of brightest and closest examples of a planetary nebula, a gas cloud created at the end of the life of a Sun-like star. The remnant central stellar core, destined to become a white dwarf star, glows in light so energetic it causes the previously expelled gas to fluoresce. The featured picture, taken in the light emitted by oxygen (shown in blue) and hydrogen (shown in red), was created from 74 hours of exposure over three months from a small telescope in a backyard of suburban Melbourne, Australia. A close-up of the inner edge of the Helix Nebula shows complex gas knots of unknown origin.